I am no great designer, let me start out by saying that. This post is not about showing off my design abilities. I do try to pay attention to the golden ratio and classical shapes when I create something from scratch but mostly I just try to come up with usable, functional ideas that will be of a good proportion. I fall back on my instincts for most of this and believe they lead me in the right direction most of the time. Now my brain can get in the way of my instincts, the trick is to control this rivalry. As I have written here before I did not take a single shop class all the way through my years of formal education. For what ever stupid reasons I had, it did not appeal to me as an elective. I did, however, take every single art or humanity class I could get my feet into. I competed in state competitions in a program called "Visual Arts Classic" and won a few blue ribbons, (back when blue ribbons meant something other than being a participant). My work was never technical or clean, instead I focused on emotion in the art I created, trying to get it to feel right. I really thought for many of my younger years that when I grew up I was going to make my living as an artist. You may think that since I have found woodworking now, I probably enjoyed three dimensional art like sculpture. That couldn't be farther from the truth. I hated sculpture, drawing was my real thing, a little painting too, but that was always an extension of the application of graphite or charcoal to paper. The great thing about my media of choice is that it was always immediately accessible. I would draw all the time, fill up sketch pad after sketch pad, drawing things from my mind, and from the real world too.Real life took over after high school and a lot of that fell to the side. I have still always toted around a sketch book though, to jot a quick doodle or write down a line of poetry or dirty limerick that comes to mind. 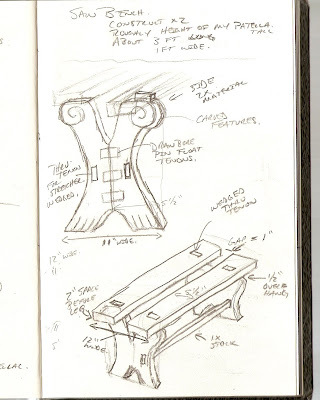 It should be no surprise though, that my creation process begins in my sketch book and evolves from there. When I get an idea for a piece and it starts with a rough sketch, no real concern for getting exact in the measurements, that comes later, just some rough guesses and a picture or two drawn in proportion to get the idea out of my head and before my eyes, where I can play with it. To demonstrate this I have scanned the process I went through for my next project. A pair of saw horses, (I know, I know, Ohhhhhh...Ahhhhhh...) Seriously though, I have always built saw horses for power tool use, roughly the height of my table saw, lifting the work high so I can see it and stand up straight. 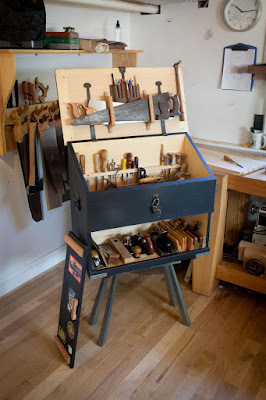 But with my new adventures into hand tools, I find the need for some more traditional sawhorses of a lower height. 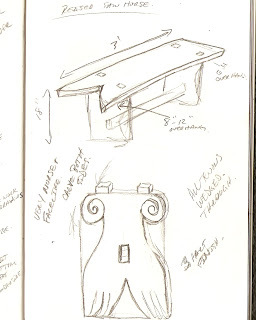 The first pic here is the first sketch I made after thinking about what I wanted in a saw horse. I was a little enamored of a "V" shaped relief cut into one end, used to start rip cuts, or smaller shorter cuts. I had seen in this style in a picture on the net and I thought I could improve on it by bisecting the saw horse top the whole way down. I though, "maybe I could even get away with just one saw horse if I can use this middle relief for ripping. The design of the legs I liked, these pieces will get use in front of some crowds at renaissance and medieval fairs and festivals and I want them to pop a little. I drew this up in mid February and let the idea percolate a bit in my head. Here is the final sketch. After thinking about the center relief I decided that supporting the wood on both sides might lead to some pinching and binding while using a push style saw. I certainly did not want these puppies to make the work more difficult. So I reconfigured the design, more solid on my measurements and settling on the "V" relief. The carving into the legs remained. This was my favorite part of the first design. The next step from having a sketch is to make a scale drawing of graph paper. At this point I try to work out final sizes and proportions, I continue to work back and forth between the sketch and the scale drawing, making notes on specific joints, maybe a finish idea, reminders for myself. Typically speaking I will have both the sketch and scale drawing sitting out to refer to regularly while I work on a piece. 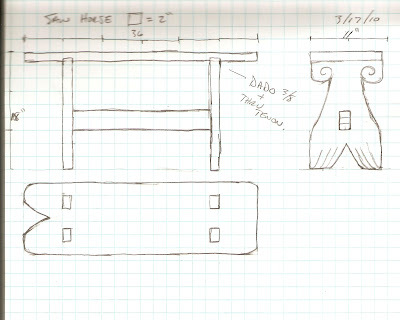 A pair of sawhorses is pretty straight forward, it did not require a lot of notes, often the page is full of them, including close up visualizations of problem joints and ideas. The other thing I really like to do, (but have not taken the chance to do in the Wood Shop Jr. yet) is to use a cork-board and thumbtacks to hang up dozens and dozens of drawings, pictures printed off the computer, reminders and ideas. This gives me a chance to pass by them on a daily basis, this keeps them in my head and helps a lot with solving a troublesome design. Here is a pic from one of my previous shop incarnations that shows the board at work, directly at the bottom of the stairs into the shop. First thing I would see. 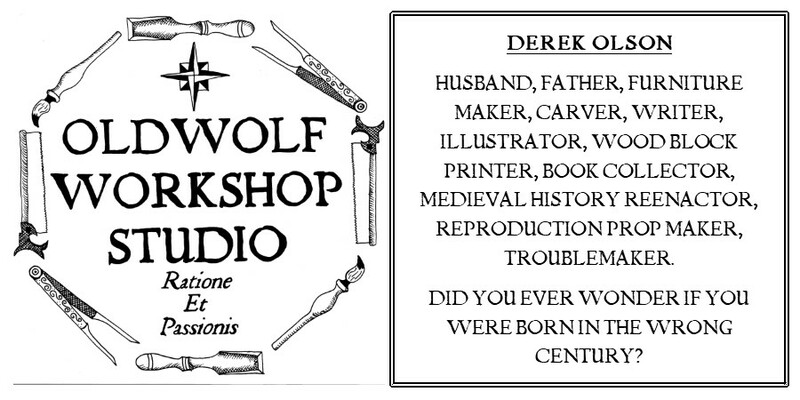 I do hope to recreate this again someday in a full size shop. . . Ahhh pipe-dreams, so sweet.